I've rediscovered my love for wrap dresses. Only after clearing them out last year. I have a black Missguided one that I've had for a few years now and refuse to let it go. Even though the slightest of breezes leaves me very indecent! Must find a way to fix that hahahaha! I love your floral wrap dress. Hold onto that baby. It' not often you find a piece that you reach for time and time again. Yes, the floral wrap dress is definitely a keeper! Hope you can find a way to fix yours! Maybe a longer slip underneath? I prefer ones that wrap right around underneath then it doesn't matter if the top flap flies open, you're still covered with the wrap under it, haha! I love the look of wrap dresses but I do not own one. I am not a very huge fan of the deeper neckline and even with a cami underneath, I seem to not like it. Perhaps I haven't found the right one yet?? I love both outfits Mica. They are both beautiful dresses! I also like that rainbow key chain. Very cute! I absolutely love both wrap dresses! I think it's one of the most flattering pieces for a woman. 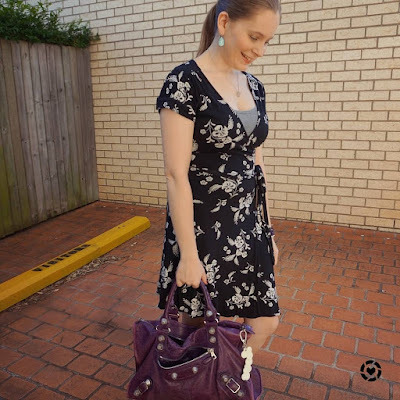 Love the contrast of the purple bag with with black wrap dress. Thanks for the link up! Thank you, and thanks for joining the link up! More than 13 years? That is impressive, the quality must be amazing. Was it expensive? Not at all! It's from Jeanswest, which is a high-street store. Although I don't remember the exact price! Love both of these, especially the first one! I can see why it's stayed in your closet for 13 years. And the colors of the Balenciagas go so well! Theses dresses look stunning on you! I've always loved a good wrap dress. SO cute! I have a black and white wrap dress like this that I've had for ages too. I just can't get rid of it because it's perfect for so many things. It's definitely a classic! Thanks for linking up! Hi Mica! I really like the lines of the second dress with the longer hem and tulip bottom, it looks so nice on you! I like that you mixed the blues as it's something I have fun with, too. You wear the wrap dresses so well - they're super flattering! I love this style of dress too, and even more than that, I love seeing warm-weather outfits on your blog while it's so cold over here in the UK haha. Have a fantastic week! Wrap dresses are indeed a very chic and versatile option for the office. Totally impressed that you've had that first dress for so long. It's such a timeless design and it must be quite well made to have held up for so long. Yes a wrap dress is definitely a classic design, and this dress is a firm favourite! Wrap dresses are always a good choice I say, they are feminine but look professional. I love both of the wrap dresses you wore and the Balenciaga bags you wore with them. The second outfit especially appeals to me. I like the midi length of that wrap dress, that's not a common style for wrap dresses. The print of the dress is also lovely and it goes well with that bag. For me it is totally the same! When I don't know what to wear I decide to wear a wrap dress! Your wrap dresses are both beautiful and I'm impressed how long you already own the first dress! The idea to match it with the leo flats was a very good one! Thanks Rena! It has lasted quite a while in my wardrobe! Both of your wrap dresses are so gorgeous! Your handbags match them perfectly as well. :) Hope you have a wonderful week! Love these wrap dresses and those gorgeous bags! Oh no, I hope you can find it and you didn't declutter it! This dress has survived a few declutterings! That second dress is very beautiful! What a lovely color combination! And I adore wrap dresses! I love your bag and yours dresses... Have a beautiful week! WOAH that IS a long time. Hmm not sure I have anything in my wardrobe that long, I might. But yes a classic wrap dress is perfect for the office, and out of the office as well. You really can't gor wrong and it worked DVF hahaha. I'm not sure I have anything that's been in my wardrobe longer, it's definitely an oldie! A brooch is a good idea! :) I tend to just default to a cami :) Thank you! Mica! You look gorgeous in both these outfits. A wrap dress is definitely the ultimate item for summer and it looks great for the office as well as outside it!! Yes Mica, you are so correct about this kind of dress. It’s very comfortable and classic as you mentioned that this dress is over 13 years old! It looks just as fashionable now as it did then. I love your Balenciaga bag and the leopard flats. You have some amazing and beautiful wrap dresses! I really like the second one. I hope you had an amazing start to your week. 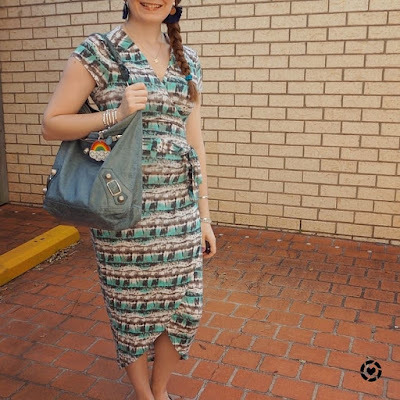 You always rock a wrap style dress! It's so nice to have those classic items in your closet that you can always turn to! I really like all the shades of blue together in your second outfit! 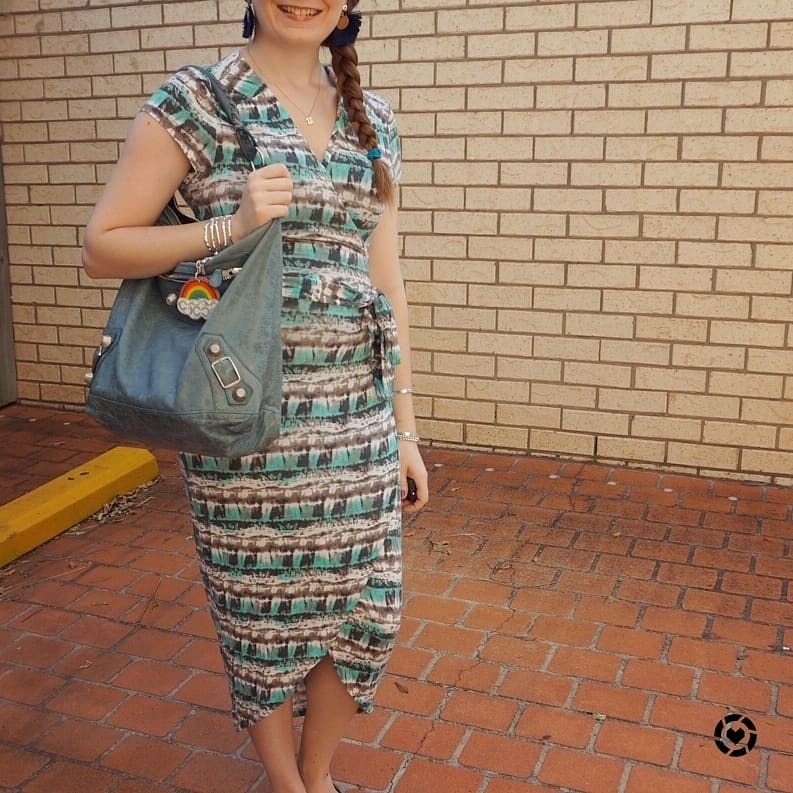 the wrap dress looks so pretty on you, it matches perfectly with the bag. 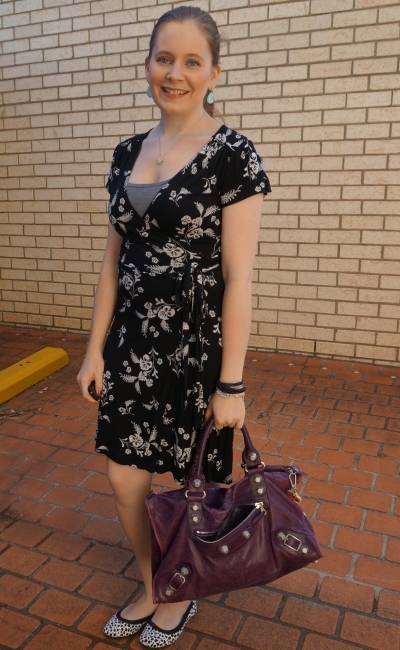 I love an easy and comfy wrap dress - such a great go-to item. You're right that a wrap dress is a great option that will work over many years and various physical changes. The wrap dress you've had for 13 years is a truly special piece and looks wonderful on you. It's classic and beautiful. I like both dresses and the 2 balenciagas are AWESOME!!! Both dresses are super cute Mica you look fab hun. Wishing you a wonderful week a head. Wrap dresses are so classic and so easy to wear! 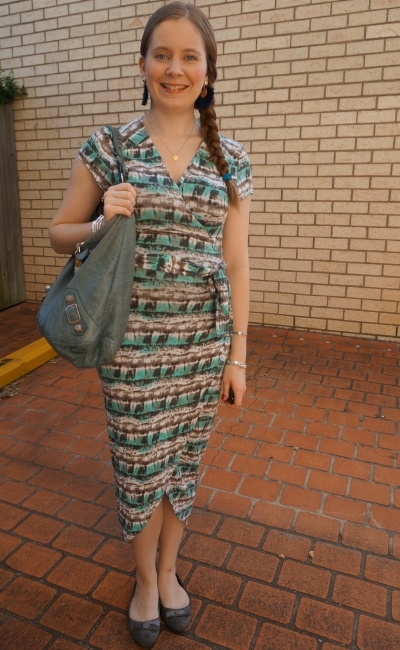 I love the print and midi-length of the second dress! Oh wow, that's a lot of Balenciagas, you have all the colours. It's good you keep them in good condition. Hope you have a nice midweek with not so much heat unlike what we have now in Sydney. haha yes I do love the colourful Balenciaga bags! they make so many great colours, it's hard not to buy a few! Your bags are simply the best...and the added rainbow fun?? I love it. I know I say I love your bags in every post...I can't help myself, as they are the first thing I notice. Then on to the next...the wrap dress is cute on you and those leopard flats are such a great feature as well! :) As soon as I get my outfit post done, I'll be linking. yay for new link ups! Thank you! I do love my handbags, they are such a fun accessory! Wrap dresses are seriously the best! Loving these on you with your colored bags. I haven't worn a wrap dress in years. Those tassel earring are so cute. I also can't wear crazy fun earring at home. You have the best bags! Love the Balenciagas! wrap dresses (and tops!!) are truly my favorite style of dress! They are soooo flattering on all body types! Love all the fun prints you've found as well. Both wrap dresses are really beautiful! I started wearing wrap style dresses last year and I love how flattering they are. And that's so cool that you've had the first one for almost 13 years! It's a great wardrobe staple to have. I hope you're having a wonderful week so far! It definitely is a great wardrobe staple! I really like wrap dresses and these are gorgeous! Love the first outfit and it's amazing that this dress is 13 years old, the quality must be great. You look absolutely lovely in both dresses, particularly that first one, Mica. I love being able to layer different camis under them for both modesty and to change up the look. Hey, you have a link-up. That's great. Those wrap dresses are both really cute and look great on you. Have a great week. I wish wrap dresses looked good on me, but they never do! You wear them perfectly! Loving the dark plum color of that bag too. It's so rich and luxurious . So cute lady!! Wrap dresses are the best so I seriously understand why you've held onto this for so long. Some of my favorite pieces in my wardrobe are definitely things I've had for years. And I love the floral and leopard combo. Mica, you wear those wrap dresses beautifully. The perfect dress for our hot Summer. Your wonderful bags are the perfect compliment. Many thanks for inviting me to join your link up. I love a good wrap dress and these are fabulous! I really like the colors and prints. The bit of aqua and tulip hemline of the second dress really draw the eye! Thanks so much for inviting me to your new linkup, Mica. I will be certain to add it to my weekly rotation. Thanks Jennie! And thank you for linking up! A wrap dress is definitely a classic. They never go out of style and a good one can last years! I adore wrap dresses. They are so feminine and flattering. Yours is beautiful. Perfect dress for any occasion. Thank you for sharing with My Red Carpet. 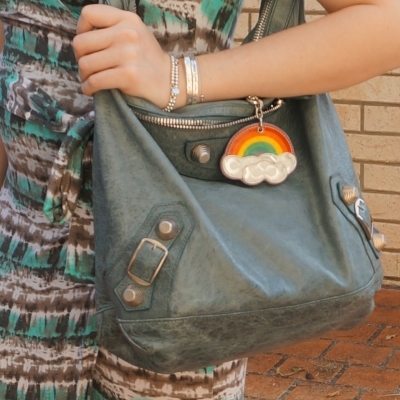 How cute is that rainbow keyring? I love the way you style your Balenciaga's, Mica! They're great bags, and look amazing with your dresses! Thanks Lorna! It's such a fun charm, I'm lucky my friend gave it to me! I love wrap dresses too. They flatter most body shapes. You look perfect in your wrap dresses. I love wrap dresses! Such an easy way to look put together! You look fabulous! Both looks cute on you dear, especially the first one. Your balenciaga bag collection is so good. I love the purple one! I love the color of your bag in the second outfit! It's so pretty and unique, and definitely goes well with the dress. You look so cute in a wrap dress! That is one style of dress I never really went in for--and I have no idea why! You should give it a try! It's a timeless classic I reckon!